This single-volume work documents Pakistan’s troubled history, which has led to current global insecurities and created a breeding ground for radical insurgency and terrorism. Why is the volatile political status of Pakistan so critical to world security? How did the tribal region of northwest Pakistan become home to numerous insurgent factions, including the Pakistani Taliban and Al Qaeda? Is the government of Pakistan actively combating or facilitating terrorism and the growth of extremism? Pakistan: The Taliban, Al Qaeda, and the Rise of Terrorism addresses and answers these questions and more, providing a current and comprehensive examination of the terrorist and insurgent groups that use Pakistan as their global base of operation. 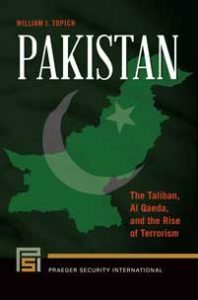 Readers of this book will better understand how the activities of terrorist groups such as the Pakistan Taliban, Lashkar–e–Taiba, and Al Qaeda in Pakistan threaten the future of the state and why the situation in Pakistan is considered by many to be more vital to American interests than Afghanistan. Author William J. Topich evaluates the changing nature of U.S. policy in the region, including analysis of policy regarding drone strikes that target various radical groups, of state stabilization options, and of ongoing United States-Pakistan relations. His assessment of Pakistan’s key role in global security accounts for the country’s longstanding conflict with India, the Afghanistan wars, and the impact of the attacks of September 11, 2001, and identifies possible future scenarios for Pakistan and the accompanying implications for security.